Understanding lifetime can be pretty tough when you’re new to IoC. Even long-time users express vague fears and misgivings when it comes to this subject, and disconcerting issues – components not being disposed, steadily climbing memory usage or an OutOfMemoryException – have bitten many of us at one time or another. Avoiding lifetime issues when using an IoC container is generally straightforward, but doing so successfully is more a question of application design rather than just container API usage. There’s lots of good advice out there, but very little of it tells the complete story from beginning to end. I’ve attempted to do that with this rather long article, and hope that with a bit of feedback from you it can be shaped into a useful reference. This article is about Autofac, but the broad issues are universal – even if you’re not an Autofac user, chances are there’s something to learn about your container of choice. Let’s begin with the issue that in all likelihood brought you here. Tracking containers like Autofac hold references to the disposable components they create. var r = container.Resolve<IMyResource>(); // Out of memory! Looking at the code above you might be tempted to think that the problem only surfaces when disposable components are resolved directly from the container. That’s not really the case - every disposable component created by the container is tracked, even those created indirectly to satisfy dependencies. var r = _resourceFactory(); // Still out of memory. Now in the main loop we only resolve one component instance and call the Go() method. Even though we’ve only called the container once directly, the leak is still there. Why does Autofac behave this way? Autofac will track every disposable component instance that it creates, no matter how that instance is requested. This isn’t, of course, the end of the road. Autofac is very carefully designed to make resource management easier than programming without a container. Notice I slipped in the word resource there? The ‘memory leaks’ we’re talking about are a result of preventing another kind of ‘leak’ – the resources that are managed through IDisposable. Traditionally, a resource might be defined as anything with finite capacity that must be shared between its users. In the context of components in an IoC container, a resource is anything with acquisition and release phases in its lifecycle. Many low-level examples exist, such as components that rely on items from the list below, but it is also very common to find high-level application constructs with similar semantics. In .NET there’s a standard way to represent resource semantics on a component by implementing IDisposable. When such a component is no longer required, the Dispose() method must be called to complete the ‘release’ phase. You can read some interesting discussions via Kim Hamilton’s and Joe Duffy’s articles on the topic of when Dispose() must be called. There’s a fairly strong consensus that more often than not, failing to call Dispose() will lead to a bug, regardless of whether or not the resource in question is protected by a finalizer (or SafeHandle). What is less clear is how applications and APIs should be structured so that Dispose() can be called reliably and at the correct time. IDisposable and using are a match made in heaven, but they only apply when a resource’s lifetime is within a single method call. Sharing: When multiple independent components share a resource, it is very hard to figure out when none of them requires it any more. Either a third party will have to know about all of the potential users of the resource, or the users will have to collaborate. Either way, things get hard fast. Cascading Changes: Let’s say we have three components – A uses B which uses C. If no resources are involved, then no thought needs to be given to how resource ownership or release works. But, if the application changes so that C must now own a disposable resource, then both A and B will probably have to change to signal appropriately (via disposal) when that resource is no longer needed. The more components involved, the nastier this one is to unravel. interface ICache // : IDisposable? The initial implementation may return only MemoryCache objects, that have no resource management requirements. However, because we may in future create a FileCache implementation, does that mean that ICache should be disposable? The root of the problem here is that for any contract, it is conceivable that there will one day be an implementation that is disposable. This particular problem is exacerbated by loosely-coupled systems like those built with IoC. Since components only know about each other through contracts (services) and never their implementation types, there really isn’t any way for one component to determine whether it should try to dispose another. There is a viable solution out there. As you can guess, a) in typical enterprise and web applications and b) at a certain level of granularity IoC containers provide a good solution to the resource management problem. To do this, they need to take ownership of the disposable components that they create. But this is only part of the story – they also need to be told about the units of work that the application performs. This is how the container will know to dispose components and release references, avoiding the memory leak problems that will otherwise occur. Why not have the container use WeakReference just to be safe? A solution that relies on WeakReference is afflicted by the same problems as not calling Dispose() at all. Allowing components to be garbage collected before the enclosing unit of work is complete can lead to a whole class of subtle load- and environment-dependent bugs. Many higher-level resources are also unable to be properly released within a finalizer. As they run, enterprise and web applications tend to perform tasks with a defined beginning and end. These tasks might be things like responding to a web request, handling an incoming message, or running a batch process over some data. These are tasks in the abstract sense – not to be confused with something like Task or any of the asynchronous programming constructs. To make this clearer, we’ll co-opt the term ‘unit of work’ to describe this kind of task. Determining where units of work begin and end is the key to using Autofac effectively in an application. Autofac caters to units of work through lifetime scopes. A lifetime scope (ILifetimeScope) is just what it sounds like – a scope at the completion of which, the lifetime of a set of related components will end. Component instances that are resolved during the processing of a unit of work get associated with a lifetime scope. By tracking instantiation order and ensuring that dependencies can only be satisfied by components in the same or a longer-lived lifetime scope, Autofac can take responsibility for disposal when the lifetime scope ends. This is all it takes to avoid memory and resources leaks with Autofac. Don’t resolve from the root container. Always resolve from and then release a lifetime scope. Lifetime scopes are extremely flexible and can be applied to a huge range of scenarios. There are a few handy things to know that might not be immediately obvious. Many lifetime scopes can exist simultaneously on the same container. 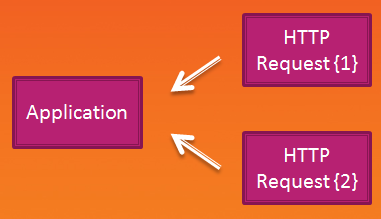 This is how incoming HTTP requests are handled in the Autofac ASP.NET integration, for example. Each request causes the creation of a new lifetime scope for handling it; this gets disposed at the end of the request. Note that we call the root of the lifetime scope hierarchy the ‘Application’ scope, because it will live for the duration of an application run. The container itself is the root lifetime scope in an Autofac application. When a lifetime scope is created from it, this sets up a parent-child relationship between the nested scope and the container. When dependencies are resolved, Autofac first attempts to satisfy the dependency with a component instance in the scope in which the request was made. 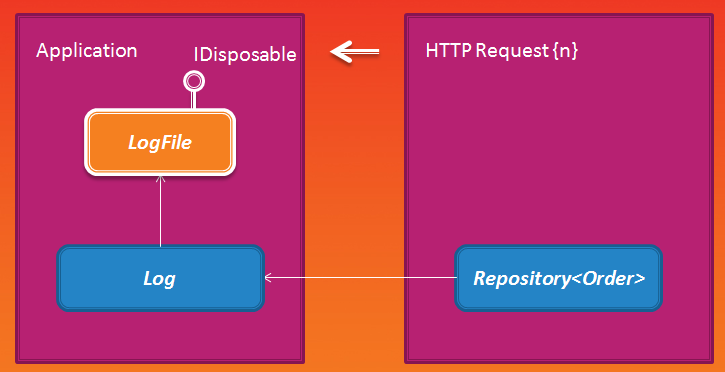 In the diagram below, this means that the dependency on an NHibernate session is satisfied within the scope of the HTTP request and the session will therefore be disposed when the HTTP request scope ends. When the dependency resolution process hits a component that cannot be resolved in the current scope – for example, a component configured as a Singleton using SingleInstance(), Autofac looks to the parent scope to see if the dependency can be resolved there. When the resolve operation has moved from a child scope to the parent, any further dependencies will be resolved in the parent scope. If the SingleInstance() component Log depends on LogFile then the log file dependency will be associated with the root scope, so that even when the current HTTP request scope ends, the file component will live on with the log that depends on it. At this point in our discussion of lifetime management (you thought we were going to talk about memory leaks but that’s just how I roped you in!) it is worth mentioning the relationship between lifetime scopes and how Autofac implements ‘sharing’. Also universally supported is ‘singleton’ or ‘single instance’ sharing, in which the same instance is used to satisfy all requests. In Autofac, SingleInstance() sharing will associate an instance with the root node in the tree of active lifetime scopes, i.e. the container. There are two other common sharing modes that are used with Autofac. Tags name the levels in the lifetime scope hierarchy, and they can be used when registering components in order to determine how instances are shared. In this scenario, when processing messages in a session, even though we always Resolve() dependencies from the messageScopes, all components will share a single CredentialCache at the session level. While occasionally units of work are nested multiple layers deep, most of the time a single executable will deal with only one kind of unit of work. In a web application, the ‘child’ scopes created from the root are for each HTTP request and might be tagged with "httpRequest". In a back-end process, we may also have a two-level scope hierarchy, but the child scopes may be per-"workItem". Many kinds of components, for example those related to persistence or caching, need to be shared per unit of work, regardless of which application model the component is being used in. For these kinds of components, Autofac provides the InstancePerLifetimeScope() sharing model. If a component is configured to use an InstancePerLifetimeScope() then at most a single instance of that component will be shared between all other components with the same lifetime, regardless of the level or tag associated with the scope they’re in. This is great for reusing components and configuration between different applications or services in the same solution. It is also perfectly safe to share a single lifetime scope between many threads, and to end a lifetime scope on a thread other than the one that began it. Lifetime scopes don’t rely on thread-local storage or global state like the HTTP context in order to do their work. The container can be used directly for creating lifetime scopes, but most of the time you won’t want to use a global container variable for this. Owned instances (Owned<T>) are the last tale in Autofac’s lifetime story. An owned instance is a component that comes wrapped in its own lifetime scope. This makes it easier to keep track of how a component should be released, especially if it is used outside of a using statement. In lifetime terms, this is equivalent to creating a new lifetime scope from the container, and resolving IMyService from that. The only difference is that the IMyService and the lifetime scope that holds it come wrapped up together in a single object. Autofac automatically provides Func<T> as a service when T is registered. As we saw in an earlier example, components can use this mechanism to create instances of other components on the fly. var r = _resourceFactory(); // Out of memory. Components that are returned from Func<T> delegates are associated with the same lifetime scope as the delegate itself. If that component is itself contained in a lifetime scope, and it creates a finite number of instances through the delegate, then there’s no problem – everything will be cleaned up when the scope completes. Func<T> and Owned<T> can be combined with other relationship types to define relationships with a clearer intent than just taking a dependency on ILifetimeScope. Do I really have to think about all this stuff? That concludes our tour of lifetime management with Autofac. Whether you use an IoC container or not, and whether you use Autofac or another IoC container, non-trivial applications have to deal with the kinds of issues we’ve discussed. Once you’ve wrapped your mind around a few key concepts, you’ll find that lifetime rarely causes any headaches. On the plus side, a huge range of difficult application design problems around resource management and ownership will disappear.